How Do I Create Boxplots in Excel Using SigmaXL? 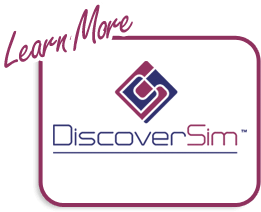 Click Sheet 1 Tab of Customer Data.xlsx (or press F4 to activate last worksheet). 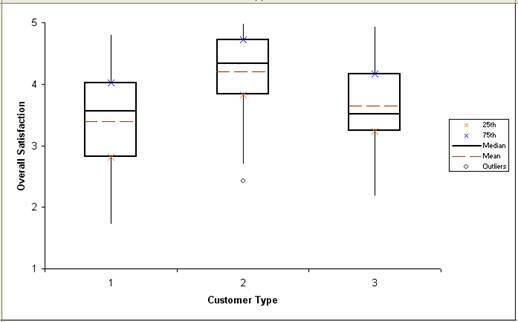 Click SigmaXL > Graphical Tools > Boxplots. The legend indicates that the solid center line is the median. The dashed red line shows the sample mean. The top of the box is the 75th percentile (Q3). The bottom of the box is the 25th percentile (Q1). The height of the box is called the Inter-Quartile Range (IQR) and is a robust measure of spread or sample variability. 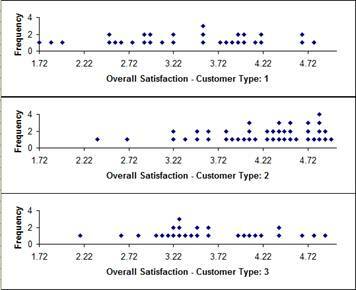 The data point highlighted for Customer Type 2 is a potential outlier (< Q1 – 1.5 * IQR or > Q3 + 1.5 * IQR). Note that extreme outliers are highlighted with a solid dot (< Q1 – 3 * IQR or > Q3 + 3 * IQR). Tip: If you hover your mouse cursor in the middle of any of the Boxplot lines as shown, you will see the balloon help indicating what the line is and its numeric Y value. 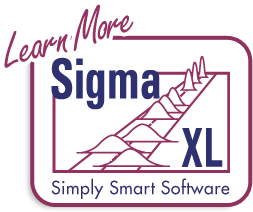 Click Recall SigmaXL Dialog menu or press F3 to recall last dialog. In order to adjust the Y-axis scale for both charts, click SigmaXL Chart Tools > Set Chart Y-Axis Max/Min. Click OK. The Y-axis scale maximum and minimum are now modified for both charts.